Hartlepool assistant boss Craig Hignett says the team must match the commitment of more physical sides if they are to maintain their recent improvement. Pools only their second defeat in seven League Two games. "The lads are taught how to defend when the ball is constantly punted forwards but carrying that out is another story. 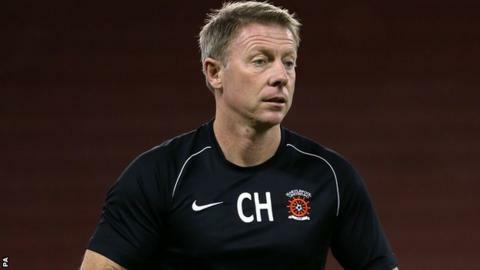 "We have to be committed and keep up the dirty, nasty work," 43-year-old Hignett told BBC Tees. "I'm talking winning second balls, closing down, tackling hard to matching your opponents' physicality. "Against Newport we took 15 minutes to start doing any of that and by then were 1-0 down." Pools were 23rd in League Two with just two points from six matches. Their run of form since then had moved them to within a win of the play-off places before the trip to Wales, but the result instead meant their opponents moved into the top seven. Next up for Hartlepool are Northampton, who have committed more fouls (200) and received more yellow cards (35) than any other team in the division so far this season, though their total of three red cards is surpassed by Mansfield, Southend and Burton Albion. And Hignett has warned the players that they cannot afford to be below their best next Saturday if they are bounce back from defeat in Wales with a positive result. "You're bound to have setbacks and me and Colin [Cooper, Hartlepool manager] have stressed that to the lads," he added. "But we have set a high standard recently. If our mentality is off by even five per cent then we'll get turned over. "We must be at it against Northampton, as it will be the same kind of test as Newport."